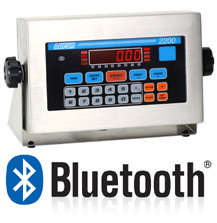 The Bluetooth Option is a complete wireless communication system. The kit includes an internal scale module (no external antennas) and a USB adapter for your PC. There are no cables to run, or connectors. No need to involve the IT department, it’s that easy. A great addition to your Doran 2200 digital weight indicator. Factory installed and configured, it’s ready to go right out of the box. You will be quickly communicating with up to seven scales at distances up to 300 feet with the high-powered Class 1 device. Data is pushed from the scale to the PC which is a faster method of data communication than RS-232 and a multiplexer that slowly polls or gathers the data from the scales. You will be amazed at how fast the data is imported into an Excel spreadsheet with Excelerator Software.